Christ Church Cathedral is the cathedral of the diocese of Oxford, which consists of the counties of Oxfordshire, Buckinghamshire and Berkshire. It is also the chapel of Christ Church at the University of Oxford. This dual role as cathedral and college chapel is unique in the Church of England. The cathedral was originally the church of St Frideswide's Priory. The site was historically presumed to be the location of the nunnery founded by St Frideswide, the patron saint of Oxford, and the shrine now in the Latin Chapel, originally containing relics translated at the rebuilding in 1180, was the focus of pilgrimage from at least the 12th until the early 16th century. In 1522, the priory was surrendered to Thomas Cardinal Wolsey, who had selected it as the site for his proposed college. However, in 1529 the foundation was taken over by Henry VIII. Work stopped, but in June 1532 the college was refounded by the King. 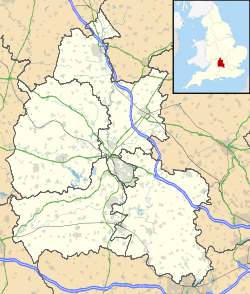 In 1546, Henry VIII transferred to it the recently created See of Oxford from Osney. The cathedral has the name of Ecclesia Christi Cathedralis Oxoniensis, given to it by Henry VIII's foundation charter. There has been a choir at the cathedral since 1526, when John Taverner was the organist and also master of the choristers. The statutes of Wolsey's original college, initially called Cardinal College, mentioned 16 choristers and 30 singing priests. Christ Church Cathedral is one of the smallest cathedrals in the Church of England. The nave, choir, main tower and transepts are late Norman. There are architectural features ranging from Norman to the Perpendicular style and a large rose window of the ten-part (i.e. botanical) type. The organ is a 43-rank, four-manual and pedal instrument built in 1979 by Austrian firm Rieger Orgelbau. The main choir, the Christ Church Cathedral Choir, consists of 12 men (6 professional "lay-clerks" and 6 student "academical clerks") and 16 choristers (boys aged 7 – 13), and is directed by Steven Grahl. They sing in university term time, at Christmas and Easter, and have an extensive touring and recording programme. Former choristers include the composer William Walton. The Cathedral Singers consists of volunteers and is currently directed by James Potter. They are usually in residence outside of term time when the choristers and academical clerks of the main choir are on holiday. The college choir sings every 1–2 weeks in term time and is made up of current undergraduates and postgraduates from the college. 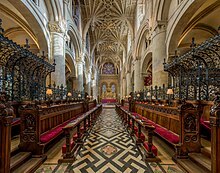 ^ "Cathedral | Christ Church, Oxford University". Chch.ox.ac.uk. Retrieved 4 March 2016. ^ Levin, Carole (2013). The Heart and Stomach of a King. University of Pennsylvania Press. p. 20. ISBN 978 0 8122 2240 1. ^ "Christ Church Cathedral – Miscellany". Web.archive.org. 6 December 2004. Archived from the original on 6 December 2004. Retrieved 4 March 2016. ^ "News | Christ Church, Oxford University". Chch.ox.ac.uk. Retrieved 4 March 2016. ^ "Dean, Cathedral Chapter & Staff". www.chch.ox.ac.uk. Archived from the original on 29 January 2010. Retrieved 22 October 2014. ^ "Canon Professor Carol Harrison – Christ Church, Oxford University". www.chch.ox.ac.uk. Retrieved 28 June 2018. ^ a b "News | Christ Church, Oxford University". Chch.ox.ac.uk. Retrieved 4 March 2016. ^ "The National Pipe Organ Register (NPOR) V2.11". Npor.org.uk. Retrieved 4 March 2016. 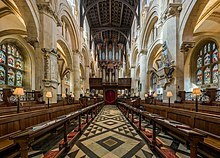 Wikimedia Commons has media related to Christ Church Cathedral, Oxford.